9.2-channel AVENTAGE model with superior three-dimensional sound field playback and the latest, most advanced Surround:AI features. A New Frontier in Sound. Discover the thrill of the most advanced cinematic surround sound in the home. Breakthrough Surround:AI technology analyses the scene of the entertainment content and optimises the surround effect in real time while you watch. The AVENTAGE model RX-A2080 features a sleek, clean design, with an elegant aluminium front panel. Even more importantly, the unit is exceptionally sturdy, with an interior reinforced with cross members in an H-shape. It also features the Anti Resonance Technology (A.R.T.) Wedge, which is a fifth foot in the centre of the unit that dampens vibrations from the power transformer and elsewhere. Thanks to these, installation stability is improved and chassis resonance is dispersed, effectively eliminating external vibration, maintaining the highest audio quality. 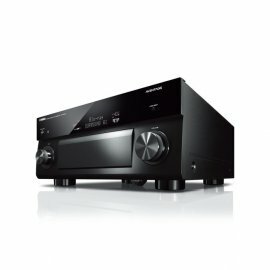 Incorporating the SABRE ES9007S Premier Audio DACs from ESS Technology to achieve an exceptionally good signal-to-noise ratio and up to 120 dB of dynamic range, this AV receiver produces professional quality digital audio. YPAO-R.S.C. (Reflected Sound Control) analyses the room acoustics with the included YPAO microphone to tune your system for the best sound in your unique room. It employs R.S.C. to correct early reflections for studio-quality surround sound. YPAO 3D provides automatic sound parameter optimisation that maximises the 3D sound field effectiveness of CINEMA DSP HD3 as well as Dolby Atmos and DTS:X. Precision EQ calculation achieves the most natural room acoustics possible. The Heart of the Smart Home. State-of-the-art configuration options and unparalleled versatility satisfy the most demanding whole-of-home applications. Explore a world of music with music streaming services* built-in. Syncing your playlists and song likes from your smart phone or computer to the RX-A2080, music streaming services make it impossibly easy to either listen to your faves or discover new music. The RX-A2080 is equipped with three Yamaha original high performance DSP devices, achieving high speed and large capacity audio signal processing. As a result, CINEMA DSP HD3 playback can reproduce up to 11-channel sound — on even a 7-channel system. The total reproduction of spatial data, including the vertical axis, helps create an overwhelmingly realistic sound field. Since the RX-A2080 has three HDMI output terminals, simultaneous connection to the TV, LCD projector and other devices, is possible. Which means, for example, that you can use your TV as usual but use the projector for your favourite movies and special programming, or have the same main room content shown in other rooms as well — easily and without having to change any connections. Naturally, the built-in HDMI functionality is of the latest specifications, corresponding also to HDR (Dolby Vision Compatible, Hybrid Log-Gamma), 4K / 60p passthrough, 4K upscaling, and so on. Simple and straightforward operation, whether using specially designed compatible apps, intuitive on-board menu, or in conjunction with Amazon Alexa voice control devices. “Alexa, ask MusicCast to play Favourite 1 in the Kitchen.” With Alexa voice control integration, all you have to do is ask. The RX-A2080 name offers full compatibility with Amazon’s range of voice control devices. Welcome to the smart home. Weight: 17 kg; 37.5 lbs.